Muffler scooter upgrade for 1PE40QMB. Very nice Touring system from Portuguese Touring manufacturer Tecno. Well-manufactured optical upgrade with sporty and crisp performance. This system is an excellent alternative to an exhaust in the original design. 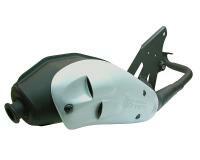 The upwards-slung silencer gives the scooter a subtly sporty look. The perfect replacement. It can also be used effectively with 70cc sport cylinders. Easy tuning and moderate noise, even on 70cc cylinders. See application chart for full list of scooters with the Minarelli 2T Chinese version 1PE40QMB engine.